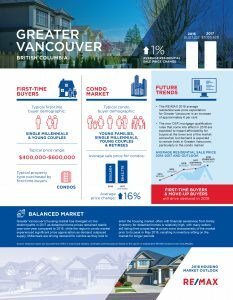 Some regions and segments of the market in the Greater Vancouver may be experiencing some slightly different market conditions than the overall consensus reports. Greater Vancouver’s housing market has diverged on two distinct paths in 2017 as detached home prices remained stable year-over-year compared to 2016, while the region’s condo market experienced significant price appreciation as demand outpaced supply. Millennials are driving demand for condos as they look to enter the housing market, often with financial assistance from family. Inventory for detached homes is relatively high, with many sellers still listing their properties at prices more characteristic of the market prior to its peak in May 2016, resulting in inventory sitting on the market for longer periods.